The Cub Scout program was formally launched; there were 5,102 Cub Scouts at the end of 1930. Scouts participated in the Oregon Trail Memorial Centennial. The Chief Scout Executive served as chairman of the committee on youth outside the home and school for President Hoover's White House Conference on Child Health and Protection. Scout circuses, merit badge exhibits, expositions, rallies, and other gatherings increased in number and scope. Membership, December 31, was 847,051. Total members to date, 5,249,350. At the 21st annual meeting held in Memphis, Tenn., Mortimer L. Schiff was elected president. Within a month of his election, Scout organizations throughout the world were saddened by his untimely death. Walter W. Head was elected to fill the unexpired term of Mr. Schiff. The divisional plan of organization was put into operation at the national office. The Sixth International Scout Conference was held near Vienna. The first Silver Beaver Awards were presented for distinguished service to boyhood within a council. Membership, December 31, was 878,358. Total members to date, 5,658,485. At the 22nd annual meeting, the National Council adopted the 10-year program of growth-a plan to enroll one of every four 12-year-old boys and keep them in Scouting for 4 years. To stimulate this effort, President Hoover presented awards to Scout units, councils, and regions reaching a specific standard for the year. Mrs. Jacob H. Schiff presented the Mortimer L. Schiff Scout Reservation at Mendham, N. J., in memory of her son. Work in emergency relief continued. There was strong development in troop camping under council-trained leadership. Membership, December 31, was 878,461. Total members to date, 6,019,301. President Franklin D. Roosevelt became honorary president and former President Hoover, honorary vice-president. The Mortimer L. Schiff Scout Reservation was formally opened and dedicated. The Fourth World Jamboree was held at Godollo, Hungary, with 21,000 Scouts from 46 countries and an American contingent of 406 Scouts and leaders. Membership, December 31, was 904,240. Total members to date, 6,389,551. In response to the request of President Roosevelt in a radio address delivered February 10, Boy Scouts performed a nationwide Good Turn, collecting 1,812,284 items of clothing, household furnishings, foodstuffs, and supplies for the distressed and needy. President Roosevelt announced a national jamboree would be held in Washington, D.C., in 1935. A strong program of cooperation was developed with the Catholic Church. Special emphasis was placed on the health program. The Order of the Arrow program was approved. Membership, December 31, was 973,589. Total members to date, 6,530,330. The entire Scout membership celebrated the Silver Jubilee of Scouting. For the first time, the membership passed the million mark. Observed as part of the 25th anniversary celebration: Boys' Life anniversary in March, ceremonies incident to the publication of the 5-millionth copy of the Handbook for Boys in April, the Silver Anniversary Meeting of the National Council in October, and Christmas holiday camps. The proposed national jamboree was canceled because of an infantile paralysis epidemic. Membership, December 31, was 1,027,833. Total members to date, 6,945,160. 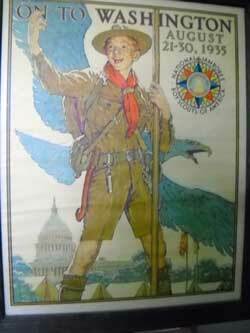 In a broadcast on February 8, President Roosevelt again invited the Scout membership to a national jamboree to be held in Washington in July 1937. The Sixth National Training Conference for Scout Executives was held at French Lick, Ind. The 26th annual meeting of the National Council took place at Atlantic City. In recognition of its health and safety programs, the American Children's Fund made a grant of $100,000 to the Boy Scouts of America. The new Handbook for Scoutmasters was published. Membership, December 31, was 1,069,837. Total members to date, 7,376,961. The First National Jamboree was held in Washington from June 30 to July 9, at the invitation of President Roosevelt, with an attendance of 27,232 representing 536 councils. This was followed by the Fifth World Jamboree at Vogelenzang, Holland (attendance in the American contingent: 814), and the Ninth International Scout Conference. A retirement plan for professional leaders was adopted. Membership, December 31, was 1,129,841. Total members to date, 7,858,931. The national program emphasized Americanism and a rededication to the Constitution of the United States and the Declaration of Independence. A magnificent gift was made by Waite Phillips, a campsite known as Philturn Rockymountain Scoutcamp (later changed to Philmont Scout Ranch-see 1941) consisting of 35,857 acres of land on the eastern slope of the Rocky Mountain Continental Divide, near Cimarron, N.M. Scouts rendered unusual service in the New England hurricane and floods. The first grants from the Frank Phillips Foundation were made in Oklahoma and part of Texas to extend Scouting. Membership, December 31,1,242,009. Total members to date, 8,399,923. Philturn Rockymountain Scoutcamp was opened for advanced Scout camping. Scouts participated in the Golden Gate Exposition and at the New York World's Fair. A session of the 29th annual meeting was held at the New York World's Fair for a citizenship ceremony when a group of former Scouts who had just become 21 were formally received into citizenship by U.S. Supreme Court Justice Owen J. Roberts. The l0th International Scout Conference was held in Edinburgh, Scotland. The Seventh National Training Conference for Scout Executives was held at Bretton Woods, N.H. The Boy Scouts of America was represented at the White House Conference on Youth in a Democracy by the Chief Scout Executive. Special experimental work with Scouting in less-chance areas was carried on through the Irving Berlin Fund. Membership, December 31, was 1,357,993. Total members to date, 8,977,696.